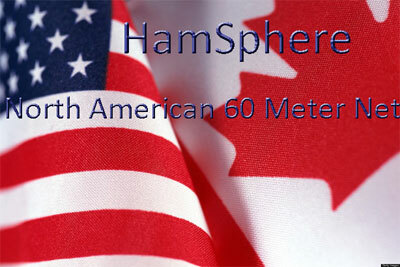 We will soon be releasing the beta version of HamSphere 4.0 on Android. The app is divided into three sections; LCD, Plug-In field and PTT. The mid section Plug-in field is swipe-able and the operator swipes between the plug-ins. 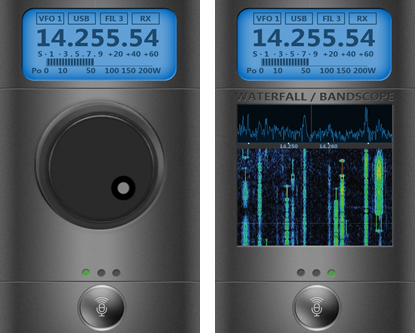 The app supports 160-10m band, USB, LSB and CW (with optional CW plug-in). There will be a special web shop for Mobile Plug-ins. The exact release date of the Android app is yet to be determined but planned before end 2016. The iOS version (iPhone, iPad etc) is planned for 2017. This is an annual award. This will be issued to top scoring DX operator after every calendar year as per rules. This is a time bound award. The eligibility for this award will start from 1st January of the year and will be open for points accrual till 31st December of each year. A new Master DXer Award" will be setup each year. The awards will be designated by the year. For instance, "Master DXer Award - 2016", "Master DXer Award - 2017" and so on. Each year 5 top scorers will be awarded with the designated award certificates. There will be three sets of Milestone certificates which will be awarded to top qualifying DX operators after every quarter. These certificates are designated with the following titles. "Master Dxer Milestone Certificate - Q1 20xx", "Master Dxer Milestone Certificate - Q2 20xx" and "Master DXer Milestone Certificate - Q3 20xx". Here, 20xx stands for the year designator, while Q1, Q2 and Q3 stand for quarterly periods 1st Jan to 31st March, 1st April to 30th June and 1st July to 30th September respectively. The score tally of operators within the designated quarter will be computed as per rules to select winners for the quarter. Each of these Milestone Certificates will be issued to 3 top scorers every quarter. Three new awards have been added to the 4.0 scene. Work All States - WAS, Work 8 Canadian Provinces - CAN and Work 21 Mediterranean countries MED. Second official Late Night DX Gang contest. It is very similar to famous CQ WW WPX contest on real HAM radio. You need to work as many prefixes (for example UR5, 5B4, F8, 14HS1, 19WO1, 43HS0 etc) as possible. The HamSphere 4.0 Tranceiver is a great looking rig straight out of the box but when you start adding Plug-Ins to your Transceiver the combinations are many. We have many new Plug-Ins available in the Shop to make your Transceiver stand out. Create your own style that you feel comfortable with. Design one for DXing, one for Rag Chewing or one for the 2m band. This is the small version of the Image Viewer plugin, which allows you to have handy reference charts, maps, lists, and diagrams available right on your HS 4.0 Transceiver. Choose from the included Band Plan or DX Monitor Map or select a .jpg, .jpeg, .bmp, .png, or .gif file from your computer to from the Internet display on this large plugin. This is the medium version of the Image Viewer plugin, which allows you to have handy reference charts, maps, lists, and diagrams available right on your HS 4.0 Transceiver. Choose from the included Band Plan or DX Monitor Map or select a .jpg, .jpeg, .bmp, .png, or .gif file from your computer to from the Internet display on this large plugin. 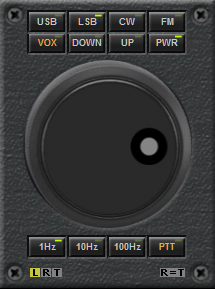 The Advanced VFO covers the USB, LSB, CW and FM modes as well as Power Off and VOX. In addition it comes with a step up/down buttons. The frequency can be adjusted in 1-Hz, 10 hz and 100hz steps. Max 3 events per day can be added per operator and max length is 6 hours. This is a "Fish-bone" variant of the LPDA utilizing a 21 element array covering 80-10m all bands. Slim height, small width Horizontal Button panel with 9 buttons. Useful Temperature converter between Celsius (Centrigrade) and Fahrenheit. Net Controller Plug-In. Use the module as NET Moderator or participant. The plug-in has two lists, one for the available Nets for the day and one for participants. The NET list will high light the event in Green color when a NET is active and in Red when you have selected an active net. The plug-in listens in on the NET frequency and automatically populates the participants list and show RX/TX status as well as number of transmissions and total TX length. The Moderator/Controller = the owner of the Net, can remove participants that for instance can't be heard or do not belong to the net. 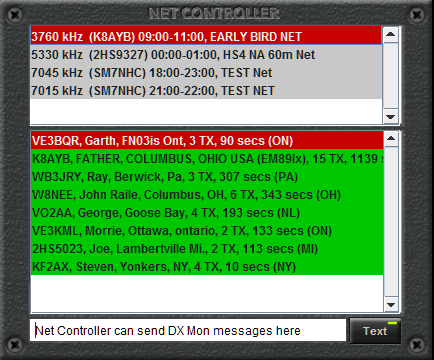 The Net controllers may also send global messages to the DX Monitor window with for example info about the net. NETs are added and maintained with the Event Calender plug-in. We have prepared a list of all free plug-ins that you can get for your HS4 rig. India DX Net (a.k.a IDX Net) is into its fourth year of operation on HamSphere. Since its inception on 2nd August 2013, IDX Net has been running on a daily basis on HamSphere 3.0 platform. However, currently we operate 4 days a week primarily on HS3 but we also conduct special sessions on HS4. The objective of IDX Net is to disseminate information regarding both HamSphere 3.0 and 4.0 platforms. 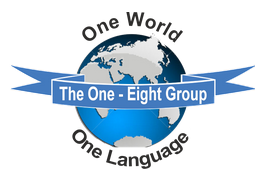 It is a discussion net with a global reach. Not only is the net regarded as a source of authentic information pertaining to HamSphere, it also regularly dwells into topics related to HF Radio Propagation, Antennas, Operating practices, Ethics, HF Transceivers, Station equipment setup and various other matters related to Ham Radio. Our strength stems from the vast pool of knowledge-base and collective wisdom of participating Ham Radio operators. Although the topics discussed on IDX Net are more relevant to HF radio and HamSphere 4.0, we have consciously chosen to run our net mostly on HamSphere 3.0 and occasionally on HamSphere 4.0. This is a deliberate decision since we believe that new operators prefer to start on HS3 to get a better understanding of HF radio before venturing into HamSphere 4.0. Hence we consider it to be our obligation to the HamSphere community to maintain our presence on HS3. 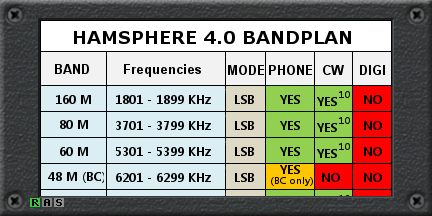 HamSphere 4.0 has always endeavored to provide an excellent and realistic virtual HF communication environment with a carefully modeled propagation platform and real-time updates. The virtual HF antennas on HS4 feature unparalleled performance with ultimate accuracy and uncanny realism when compared to the real world HF antennas. To go a step further, HamSphere has recently updated its propagation model to ensure an even finer experience for operators by adopting URSI coefficients. To leverage the experience and extract maximum mileage from this wonderful setup, it is even more important now for the operators on HS4 to acquire a better understanding of HF propagation. To cater to this need, India DX Net conducts special sessions and on-air workshops to familiarize operators with the finer nuances of HF propagation. 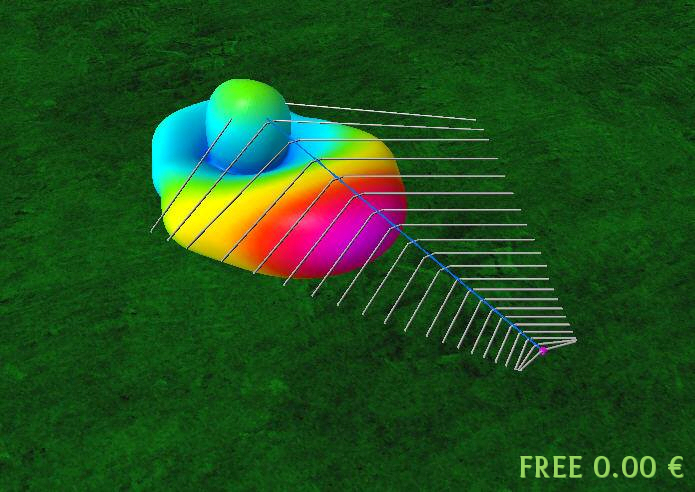 To further bridge the information gap and to assist operators to leverage the fascinating art and science of HF propagation and antenna selection and usage, IDX Net has decided to run a Facebook group which is dedicated to these topics. The "HamSphere IDX Net - HF Radio" group is an officially recognized and approved HamSphere FB group which is moderated by IDX Net Controller (VU2NSB) who is also an administrator on HamSphere. Here we cover various aspects of HF Propagation, how to find and predict band opening, Ionospheric behavior, influence of Solar Cycle, seasonal and diurnal variations in propagation, which bands to use at what time of the day or seasons, etc. Antenna related topics explain Antenna behavior, variety and types of antennas, their finer points, performance and usage under different conditions. Here we also cover techniques required to optimally use the HF radio transceiver to achieve best on-air performance, and how to work DX and establish communication under difficult and hostile weak-signal band conditions. To facilitate questions being asked by operators who seek further information, our group page provides the comment section of the pinned post for the purpose. Questions asked via pinned post comments are often translated in to full fledged informative articles. Those who have not joined "HamSphere IDX Net - HF Radio" Facebook group so far and wish to do so may click on the following group URL to join..
IDX Net is a world-wide net. Please check our operating time and frequency below. Come and join us regularly for on-air live discussions. Net Time: 13:30 UTC onwards on Monday, Wednesday, Friday, Saturday. The net runs Monday through Thursday @ 01:00 UTC on 60 Meter Band @ 5.330 Mhtz. The net is active for 1:30 Minutes with participation by several North American .Central American and Canadian stations due to the propagation patterns on the 60 Meter band. The days of summer are over and propagation on 60 Meters has returned to North America. Those stations looking to take advantage of this improved propagation, come join in the round table discussion format net at 0:00 UTC. The net will run Monday through Friday on 5.330 Mhz. Again the format will be round table discussion format. During the net, exchange of RS reports will be discouraged until the closing “73” round to enable max round table discussion time. A one on one SR method is recommended. We look forward to your participation in this activity net. See you on 60 Meters very soon. Check out the new net control module in the Hamsphere store. The module shows all the active participants and more on the scheduled net! There have been some great reviews on the Face Book pages about this module. 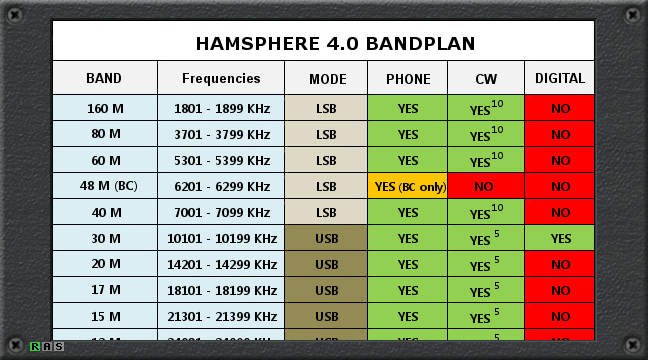 With the new WAS award being released it would be a good idea if we all checked how our QTH apprears on Hamsphere 3 and Hamsphere 4. This is especially important for USA and Canadian stations. For those that do not know the frequency is 3.750. For those that need their 25 states to get their 80 Meter Award this is the place to be. Propagation is becoming better now on 80 meters so that will help improve the net for sure. Remember when you do make contact with a station you need, please try and keep your contacts down to signal reports only and if need be one or two very short messages, we want to move along as quickly as possible to get everybody a chance to work those they may need, stateside and DX alike. See you all there 73 N8RGO. Check out if you have the 'Worked 50 Countries Award' on HamSphere 4. Once you have this and... You make some contacts between 22:00 UTC and 5:00 UTC, you can become a member of our 'gang'. You DON'T have to be QRV every 'night'... but if you want to belong to our crew, you have to try at least once a week. We are looking for HS4-stations that are proud to belong to this group! 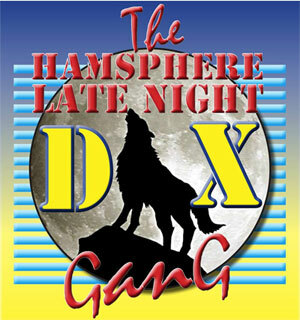 The HamSphere Late Night DX-gang is the biggest family of HS4-users! The nets intent is to encourage chat with trial users and assist them with any issues they have with HamSphere, and we can also assist with any computer issues that will improve their use of the programme. We also encourage them to subscribe and become part of the HamSphere family, and hope that we can chat further on and become firm friends on HS3 & HS4. All of the Nets on HamSphere do a fantastic job in encouraging, mentoring and assisting new users, and this is what the HamSphere programme is all about. We hope to see many more becoming subscribers and potentially new HF operators of the future. The Weekly chat net will now run on freq 145.500 on the 2m band on HS4 . 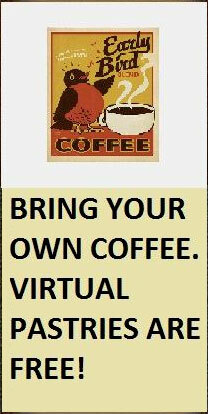 Times will be Mondays and Fridays 18h00 to 20h00 UTC . Welcome to the HamSphere DX-Expeditions group. DXpeditions are fun. Make sure you plan your DX-Expeditions and have all "Special" call signs prepared and in working order BEFORE you head out. Please contact Martin 161HS363 to provide you with Special Activation call signs. Our authorized "Expedition" callsigns will be very specific. We are starting out with the IOTA (Trademark of RSGB) Island On The Air concept. We will call this IOHS = Islands on HamSphere. Later on we may extend these DX-Expeditions to cover Lighthouses, Castles or other exciting fixed landmarks. 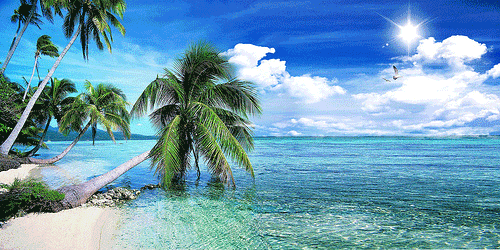 country in the Caribbeam with its 72.000 people. HQ station, W1AW will also be on HS on that week. Results: HamSphere 3.0 "4th of July contest 2016"
Here are the results of the HamSphere "4th of July Contest 2016 " that was held 4-5 July 2016. The results are based on a properly filled out logbook and that power limitations were kept. We had a total of 159 participants performing 5528 QSO's. Congratulations to Fernando 31HS683 who again won this contest with the amazing score of 35404. Well done indeed! (He won in 2014 too) Fernando managed to complete 212 valid QSO's and 166 multipliers. Here are the results from the "HamSphere 4.0 Spring Contest 2016" that was held 9 and 10 April 2016. 1st Prize: Pat, 14HS1, France with 421388 points wins 100 HS Credits. Congratulations! 2nd Prize: Igor, UA9UCO, Russian Federation with 386349 points wins 50 HS Credits. Congratulations! 3rd Prize: Andy, SP2DNI, Poland with 320229 points wins 40 HS Credits. Congratulations! 4th Prize: Dainius, M0HMJ, Great Britain with 307560 points wins 30 HS Credits. Congratulations! 5th Prize: Wojtek, SP4QCU, Poland with 301994 points wins 20 HS Credits. Congratulations! 6th Prize: Toshi, HS/JA2DOU, Thailand with 292444 points wins 10 HS Credits. Congratulations! 7th Prize: Chris, 50HS5873, Russian Federation with 204693 points wins 10 HS Credits. Congratulations! 8th Prize: Sebastien, 14HS3000, France with 178464 points wins 10 HS Credits. Congratulations! 9th Prize: Manuel, 31HS1112, Portugal with 158580 points wins 10 HS Credits. Congratulations! 10th Prize: Ravi, VU2RVE, India with 154560 points wins 10 HS Credits. Congratulations! Congratulations to Alexander, RA9CUH who won this category with 75419 points. Congratulations to Alexander, RA9CUH who won this category with 71444 points. Congratulations to Fabio, PY5ZR who won this category with 18986 points. Congratulations to Graham, ZL3MA who won this category with 19128 points. Congratulations to Ravi, VU2RVE who won this category with 42210 points. Here are the results of the HamSphere 4.0 RDF 2016 contest. We congratulate the Epsilon team that managed to pinpoint the beacons with the score of 2592 and won this contest. They got 15HS14 within a 9 km range which is amazing!!! Experience is the keyword here and for comparison I have added the "test results" from Basu who had one other op in his "testing team". Basu did only a few beacons. We see an increased interest in these contests and we will introduce some RDF techniques in the HamSphere RDF group on facebook later so that the teams can get even sharper. Thank you to all participating contesters. Here are the results of the HamSphere 4.0 CW Contest 2016 that was held 3 Sept 2016. The results are based on a properly filled out logbook. We had a total of 31 participants. Congratulations to Igor, UA9UCO who won with the score of 3339. Well done indeed! Igor managed to complete 63 valid QSO's and 52 multipliers. Congratulations! In second place came Andy, SP2DNI with the score of 2784. Good work! Andy managed to complete 58 valid QSOs and 47 multipliers. Congratulations! In third place came Boris, 50HS7127 with a total of 1702 points. Good work! Boris managed to complete 46 valid QSO's and 36 multipliers. Congratulations! A Big Thank You to all participants. The 48 meter band has been quite active with the usual Radio broadcasters doing their thing day in day out. A few have been trying out new and different formats to attract new listeners. Radio Phly started doing what I like to call ‘Shout Outs ‘. The listener gets a somewhat rush after they post a signal report, after the song is almost finished I then announce their name and where they checked in from. This seems to have spread where we now find other broadcasters following this style. Proper station ID’s should be announced at least every 20 to 30 minutes at most from the live Radio broadcasters so it’s best to wait until you can confirm the proper ID of the broadcast before posting a signal report. Recently the Automated BC Stations have been relocated around the Globe, we do this at least once a year to keep things intriguing including helping SWL operators determine propagation conditions related to the nearby HF bands. The newly relocated BC-Hundred Stations are as follows starting with the stations ID followed by the name of the station, ending with location and frequency. BC100, Music One located in Barbados on a frequency of 06.230 MHz. BC101, BBC Broadcast located off the Coast of Darwin Australia on a frequency of 06.240 MHz. BC102, AFN Bremerhaven located just off the Weser River in Bremerhaven Germany operating on a frequency of 06.215 MHz. BC103, PCJ DXers located in the small town of Fitjabraut Iceland just East of Keflavik International Airport on 06.250 MHz. BC107 ARNL located just between The Honolulu International Airport and the Honolulu Zoo operating on a frequency of 06.285 MHz. BC109, Radio London located just North of the beautiful Vauxhall Park in London Ontario Canada operating on a frequency of 06.235 MHz. The Automated BC Stations are subject to changes as far as RF power output including antenna direction and style of antenna used. The best way to keep constant up to date with any changes is through our FaceBook group HamSphere DJing In The BC Band. You can click on the link and request to join us, looking forward having you! And yes you will be able to join live conversation between the broadcasters and listeners in real time. 73 and good SWLing from all the broadcasters including myself Steve at RADIO_PHLY. Radio_COOL (on 6295 kHz) continues to broadcast a varied format of R&B, Soul, Jazz, Country and more. Whichever format Bill selects for broadcast from Radio_COOL on 6295, you can bet it will be filled with Great "COOLness." Bill from Radio_COOL says: "Thank You to my loyal followers who continue to send signal reports and cards to Radio_COOL. We are now doing 'Live MIC' broadcasts some of the time from our studio in South Carolina, USA, so we do try to give live shout-outs to those who spot and send signal reports. We are doing Live Mic for most of our BC. Want to thank all the operators that tune us in, you make what the BCer's do worth while. Hi, my name is Steve my call sign is G7OQG i have been an operator on HS3 /HS4 since 2015 and love every minute of it. You speak to some of the nicest people you can imagine and listen to their stories. We are all one big family and we hope you too feel the same. I am part of the new Supervisory Module for HamSphere 3.0. My colleagues and myself are here to help with the smooth running of HamSphere 3.0 and to welcome you with a friendly QSO. If you see me online give me a call. Jamboree on the Air - Jamboree on the Internet. 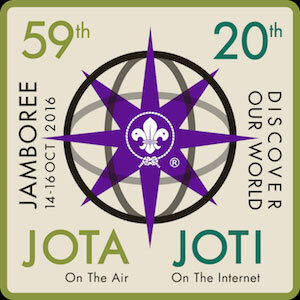 Jamboree-On-The-Air and Jamboree-On-The-Internet (JOTA-JOTI) is an official international event of the World Organization of the Scout Movement (WOSM). 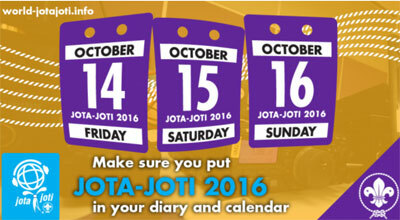 JOTA-JOTI is a youth programme event intended for young people in Scouting of all ages. The purpose of JOTA-JOTI is to enable and encourage Scouts around the world to communicate with one another by means of amateur radio and the internet, providing a fun and educational Scouting experience and promoting their sense of belonging to a worldwide Scout Movement. We have a 24-hour support ticket system where you can get support regarding anything about HamSphere. And remember, always state the HamSphere system (3.0 or 4.0) including operating system and computer model such as Windows, Mac. Linux etc for faster support. You can also attach a screenshot of the issue if you like. The HamSphere annual subscription costs 30 Euro, that is about $40 USD and includes all our features even the iPhone and Android apps. It also includes the standard 4.0 transceiver. How do I get a new password? We get this question often. Here are two links to fix this. If it still doesn't work, please contact our support and we will manually give you a new password. We have now received over 50000 recommendations on Facebook – Thank you FB users. And Thank You to over 8200 followers on Twitter. Super!! There is so much information on all of our Facebook Groups to help you with queries and please, any questions just ask away, someone will be around to help with any questions that are asked. If you haven't joined any of our Facebook groups, do a search for "HamSphere" and you will find them and click on join to become a member. Thank you for your interest and your continued Support.